Just log on here and start watching all your favourite videos from the current Official Irish Top40 (we update the list every Monday). Join Laura Wood on East Coast FM's Morning Show after 10am on Monday, when she will be getting parenting advice for dealing with troublesome teens with too much time on their hands during the summer months. Laura will also get tips for recession friendly vintage and second hand clothes shopping, chat to journalist and author Amanda Brunker about her new book "Champagne Babes" and hear an update on all the latest TV...if you have any comments please email morningshow@eastcoast.fm. 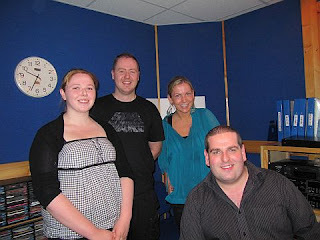 Tune in to East Coast FM just after 10am on Monday to hear the Morning Show with Laura Wood. Singer and Eurovision winner Paul Harrington guest presents East Coast FM's Morning Show just after 10am tomorrow. U2 play at Croke Park, Dublin on Friday, Saturday and Monday. Well done to all the East Coast FM listeners that won tickets for the gigs. The YouTube clip above (opening night in Barcelona) gives a taste of what is in store for those going to Croker. Join singer, songwriter and Eurovision winner Paul Harrington on East Coast FM's Morning Show just after 10am tomorrow morning. Paul, who is sitting in for Declan Meehan until the end of the week will discuss the current state of the Irish property market and the importance of better road safety when he takes to the airwaves tomorrow morning just after 10am. Paul will hear travel tips, all the best holiday deals, how to stay positive through the recession and have a chat with singer Wayne Brennan. HOW WELL DO YOU KNOW YOUR PARTNER QUIZ! The third lucky contestants arrived at the station this morning to take part in "How well do you know your partner" quiz - Karen Carroll and Brian Eyre from Arklow had a score of seven out of ten which is not enough to overtake yesterday's couple, Elizabeth and Phillip who took the lead with a score of eight. Karen and Brian got engaged on Christmas morning 2008 and are planning to marry in September 2010. Their lives revolve around their one year old daughter Chloe but when they get out they enjoy going to the cinema and restaurants. Monday’s Clue: 8am: This famous footballer won the European footballer of the year. 5.30pm: Best known for his years with Manchester United. Tuesday’s Clue: 8am: He was named as one of the 50 most stylish men in the last 50 years. 5.30pm: He was capped 59 times for his Country although he never led them to a World Cup Final. Wednesday's Clues: 8am: He was voted 11th in the IFFHS European Player of the Century Election. 5.30pm: He was discovered at 15 when the Man Utd scout sent a message to the Manager and said: I think I’ve found a genius. This week the prizes are: A Sunday Lunch Voucher for two adults and two children from the authentic Chinese menu at Ashford Oriental Restaurant. The earliest correct guess will receive an early bird meal for two from the authentic Chinese menu, Monday to Friday at Ashford Oriental Restaurant. 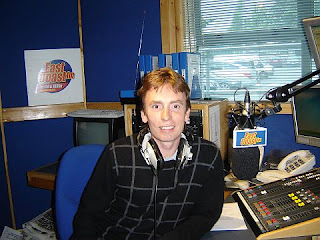 Former World Champion snooker player Ken Doherty guest presents his final Morning Show on East Coast FM this morning. Listen to him after 10am when he will be chatting to World bantam-weight boxing Champion Bernard Dunne and will catch up with Wicklow GAA manager Mick O' Dwyer about last weekends success and Wicklow's upcoming match with Kildare. Join Ken on East Coast FM just after 10am for all this and more.. The second lucky contestants arrived at the station this morning to take part in "How well do you know your partner" quiz - Elizabeth Dunne & Phillip Byrne from Wicklow Town are now our new leaders with a score of eight out of ten. Elizabeth and Phillip got engaged in May 2004 and are planning to marry in January 2010. They have three children, Darragh, seven, Clodagh, two and baby Cathal who is just four weeks old. Tune in to Freshly Squeezed just after 9am tomorrow to hear our next couple play "How well do you know your partner". Former world champion snooker player Ken Doherty is presenting the Morning Show on East Coast FM this Monday, Tuesday and Wednesday from 10am to 12pm, while presenter Declan Meehan takes a break. Musician and Eurovision winner Paul Harrington will take over presenting the show on Thursday and Friday. If you missed today's show, it's repeated from midnight tonight. The first lucky contestants arrived at the station this morning to take part in "How well do you know your partner" quiz - Aoibheann Murray & Connie O’Gara from Glenealy set the bar high with a score of seven out of ten. 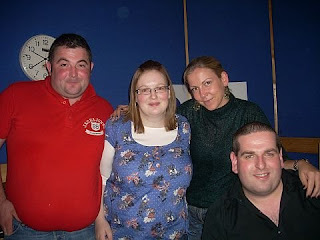 Aoibheann and Connie got engaged in November 2008 and are planning to marry in July 2010. Aoibheann is a science teacher in Coliaste Chraobh Abhann Kilcoole and Connie is one the Wicklow Crew of the RNLI, he also has a private pilots license. Wicklow took on Down on Saturday afternoon in Aughrim and did the business!